The Automatic Cap Sealing Machine is designed for automatic filling medicine into bottle (small volume) and cap sealing, such as Chinese herbs powder, dry syrup powder and aerosol powder etc. ● This machine provides powder filling, plug insertion and cap sealing functions. ● Bottles and cans are introducing by conveyor belt combined with indexing drives star wheel table. ● There is a photo sensor for bottle detection to achieve a goal of Bottle-Fill and No-Bottle-No-Fill. 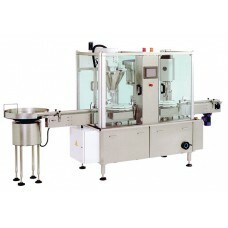 ● Automatic bottles / cans positioning and elevation, and vibratory filling. ● Employ Japan SMC air cylinder. ● The machine dose not run in case of no air supply or insufficient air pressure.